Set et inclitus ille rex arturus letaliter vulneratus est qui illinc ad sananda vulnera sua in insulam avallonis evectus. Their job was to be creative in producing translations for different audiences, from different speakers. 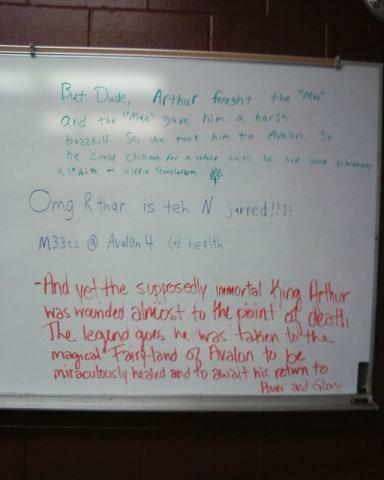 We have here the Hippy Arthur, the Text Arthur (or maybe LOLkings), and a highly skeptical writer who doesn’t care for fairy tales. Slightly dyslexic. Diana Wynne Jones. Come on, somebody click on the quiz & tell me what character(s) you are! If I answer as myself, as accurately as the questions allow, I come out as Sophie from Howl’s Moving Castle. Answering as someone I wish I were, I’m Luke in Eight Days of Luke, which I have never read. In real life, I’m slightly depressed (weather has been gray for a week) and highly procrastinatory and this really must stop. I awakened from a dream in which I was planning a graduate seminar on Leonard Cohen. It seemed odd; I knew even in the dream that this was not my area, but I was conscientiously working out what I would need to read to get up to speed on recent Canadian poetry (because I decided the focus would have to be on his lyrics as poetry, since there is no way I could manage the musical side of things), what I’d assign the students to read, how much background-filling I’d have to do on cultural and historical references (Chelsea Hotel, Berlin Wall, Tiananmen Square, Quebecois conflicts . . . ), what kinds of writing assignments I should give. I hate having dreams like that. I even prefer nightmares, actually, because they are definitely dreams, part of the night’s passage, nothing to do with real life. But a dream about writing syllabi makes me feel that I have been at work for hours before I even get up. What do you mean, I still have to write quizzes for the undergraduate course I’m teaching this term? I’ve done my teaching prep work for the day! Haven’t I? In the bad old days of majoring in a STEM field, I learned to stay up till I finished my problem sets, because otherwise I dreamed about doing them (without, however, coming up with the solutions in my sleep) and it seemed like they took twice as long. Plus ça change, hein? The first week of classes went well, and included a lot of work on the house, because that was when we could get some stuff scheduled. So I spent all weekend painting walls, as we had to move furniture anyway, and really, once you’ve moved the furniture, why not paint? 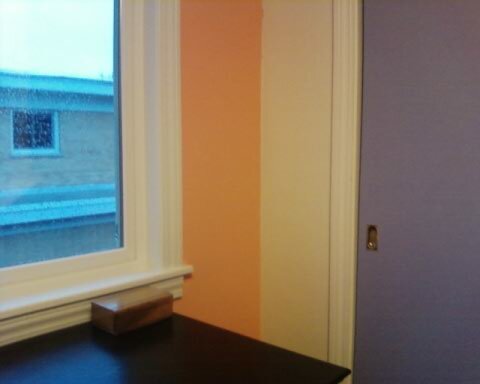 The living-dining area is now yellow (most of it), and one wall in my study is orange. The yellow is greener than I had hoped for, and the orange is . . . very zippy. That was what I wanted, though, something to wake me up and make me cheerful on cold grey mornings. If you’re good I’ll post some pictures, after everything’s finished off (more professional work on the house yet to come, and after that I’ll have to touch up some paint). But right now I am super-tired. Next up: fix dinner. After that: bath and bed. One of the endearing things about Basement Cat is his meow. He presents as such a rough, tough, thuggish guy, someone who mugs our old lady and bites the Scot’s ears, constantly harrassing our other cats. And then when he’s hungry or feels the humans are beating up on him unfairly, he lets out a tiny peeping “mew” that sounds like an adorable little kitten. It’s as if Vito Corleone sang out in an exquisite counter-tenor. Humans brandishing the squirt bottle tend to break helplessly into smiles. His voice is very different from the raucous yowls of the Shakespearean Heroine (who is able to terrorize experienced veterinary technicians), or the articulate chatter of the Grammarian (who must have some Siamese in him). The tiny mew reminds me that Basement Cat is still quite a young cat, not yet two years old, and that he will continue to mellow into a good companion. He bites less, and less hard, than he used to; Purry B.C. shows up more often and in more diverse circumstances; his attacks on the others are more playful and less aggressive (though the others have been conditioned by past experience, alas, not to want to play). It’s progress. Updated just 20 minutes later: but he’s being a pest again. In my ongoing struggle to learn classical Greek, I have been trying to memorize 5 words a day (or some new grammatical paradigm). Last week I wrote these on my desk calendar, but I wanted more space for the usual calendar things. So I got the bright idea of a post-it stuck to each day, which could be collected and used like flash cards for review, while the calendar square underneath could fill up with things to do, a word count, and so on. Guess what B.C. feels like chewing on, this morning! Driving to school today reminded me of what I do like about winter here: the colors. Or rather, the lack of them. The sky was overcast, rippled in shades of blue-gray; the snow reflected it. The sky and snow together drained evergreens to a dark charcoal, the same color as the bare trees, and tan stalks protruded from the fields’ pale background. The colors are not the same, but the many subtle variations on a narrow range of color remind me of the high desert, with its delicate shadings of olive, sage, khaki and greige. I’ve never become accustomed to the lush greens of summer in a climate with summer rains; to me, green is the color of early spring and of irrigation. Winter pales the landscape to something austere and restful, more familiar to me than the exotic shades of the rest of the year. They haven’t really hit yet. I just e-mailed my syllabi, five minutes ago, and I’m sure they will start coming very soon. I checked dates, to avoid conflicts with events in those parts of my life that do not involve teaching, and to avoid pile-ups of papers from different classes, and so I’m not giving a quiz on Easter Monday; but what may I not have thought of? I listed readings in primary texts, but not critical readings (those will be in the excessively details reading schedule; the syllabus is supposed to be an overview of topics, and I put in page numbers to make creating the detailed schedule easier). Will I regret this? I always feel conflicted about whether the paper syllabus should be a covers-all-eventualities booklet or a short-and-sweet basic intro with details on Blackboard. It usually winds up somewhere in-between, with a statement about the online syllabus being authoritative, so I can add any crucial policies I haven’t thought of. Cell phones, for instance; I haven’t said anything specifically about them, though I have a general statement about responsible, respectful behavior that can be made to cover a multitude of sins. Last term my students were generally serious, responsible people who didn’t require a legalistic syllabus. I do hope this trend continues. Tomorrow I have to do a lot of scanning and Blackboarding, and Monday we start, and where are my two hours a day of research? Syllabi, assignments, grading rubrics, quizzes: these take time. I do have some items to tweak and recycle from past semesters, but teaching doesn’t stand still. (My parents never understood this: they believed that lecturing-from- yellowed-notes stereotype.) This may also have to do with the distinction between college teaching and university teaching. I try to find some ways of letting my research into the classroom, but it takes a lot of scaffolding to present even a small research insight in a way that works for my students. Updated to add: yep, the syllabus for my grad class claims it meets at the same time and place as the undergrad class. Not actually true, just a cut-and-paste problem. I hope this will be the only problem. Instead of making resolutions or choosing a theme for the year, here’s a selection from my Wish List, things I’d like to do or get or have in the coming year. Some items are realistic; others seem not to be, but who knows? A good cat-sitter: someone who can get the picky eaters to eat while keeping the hogs from over-eating, and who can manage all the medicating. Basement Cat fully integrated into the household, playing and cuddling with the other cats, not beating up on them, not having to be isolated when we’re out or asleep for fear of mayhem. Complete healing of old ankle injury; the ability to run again; specifically, to put in 8-10 miles a week. Swim 3 miles a week (I’m at around 1 1/2 miles now). Be able to ride a real bicycle, at least around town for errands (there’s a long history of injuries and fragility here that I’m not going to go into, but a long time ago I was a really avid cyclist, and for years I have missed the feeling of cycling). Do yoga and sit every day. Steady research habits: at least 2 hours a day, 5 days a week, on reading, writing, and other research-y things. I’m not sure if this means self-discipline or playfulness or obsession with a project, or a combination of all of these. But every day makes a big difference in avoiding start-up costs in getting re-acquainted with a project, and a 2-hour chunk is enough to make real progress. See something I’ve written actually in print! Visit California, and friends there. Make some new friends. Meet some local bloggers. Find people in my field (or at least, closer to it than people in my official university-sponsored writing group) with whom to exchange rough drafts (and intermediate drafts, and isn’t-it-finished-yet drafts . . . . ). Re-do my garden: it’s very small, and it’s getting overgrown with hostas and day lilies and iris, all lovely, but really too much for a space little more than 100 square feet. The big plants need to move to suburban homes with big yards. I want to intersperse vegetables and smaller flowers: rainbow chard in place of hostas, for instance, a tomato plant balancing a clematis, and so on. But also: spend money on things that I will really enjoy and be happy to remember, instead of being frugal and then regretting that I missed something. Life is short. Happy New Year to my readers, and may your 2010 wishes come true!